The New Quiet Time Deluxe Ombré pet bed is designed with your pet and your home in mind! The ultra soft polyester cover provides your pet with comfort for all seasons and with the choice of two attractive colors, taupe to mocha or light gray to charcoal, you can coordinate with almost any decor! 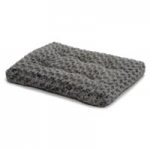 Couple this comfortable cover with a tufted plush polyfiber cushion and you have the best of both worlds! 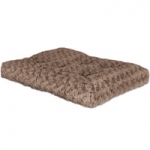 Comfort, Style and Affordability all wrapped into one pet bed! Available in 6 sizes and machine washable. 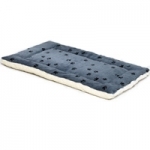 The Reversible Paw Print is made with Ultra-Soft Synthetic Fur on one side and on the other a Ultra-Plush Synthetic Sheep Skin. The mats are made with only the best quality materials and built to last! With every bed the question is how to keep it clean, well we have the answer! These beds are machine washable and machine dry, which takes cleaning to a new level. The Reversible Paw Print is available in sizes 18"- 54", and are great for use in carriers, vehicles, and crates. Midwest #40648TP Quiet Time Deluxe Pet Bed Micro Terry Taupe 46X29"
All for your pet’s Quiet Time . 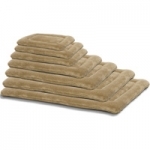 . . Deluxe Pet Beds from MidWest! Manufactured with the quality and care you’ve come to expect; all of our beds are washable with material, stuffing, and stitching that lasts! Midwest #40642TP Quiet Time Deluxe Pet Bed Micro Terry Taupe 40X27"